With the holidays upon us, we are all planning our menus. One of my favorite items to serve during this time is a ham. Not just any ham, a Tender Filet Honey Glazed Spiral Sliced Ham will be on my table! What can be easier than going online and ordering your ham from Tender Filet and have it shipped to your door? No going through those meat cases at the grocery store, you can rest assured that Tender Filet has the BEST honey glazed spiral sliced hams. out and I personally like to wrap my entire ham with the aluminum foil completely to keep the ham moist. How easy is that? Put it in the oven and bake according to the included directions. There is no need to make any glazes or sauces for a Tender Filet Honey Glazed Spiral Sliced Ham. They have done all the work for you with their secret brown sugar and honey glaze. The ham is trimmed to perfection and the flavors are "fired in" to assure the the most tasty and moist ham to ever hit your mouth! When I am looking for a ham for the holidays or special occasions, I always go straight to Tender Filet because I know they offer only the best. Tender Filet not on sells these delicious hams, they offer a wide variety of pork, poultry, lamb, desserts, seafood and much more to make cooking an ease for you. I am happy that one of my readers will have the opportunity to win a Tender Filet Honey Glazed Spiral Sliced Ham valued at $109.95 just in time for the Holidays. Enter via the Rafflecopter below and make sure to come back for the daily entries to increase your chances of winning. ham, green bean casserole, bread, apple pie. I would love ham, mac and cheese, green bean casserole and German chocolate cake! I'd like to have the Caramel Apple Cheesecake and the Dutch Crust Sweet Potato Casserole. Ham, pepper cheeses, green bean casserole, stuffing and cheesecake! I love to try the Grilling favorites. Hey! tha ham looks good to me! Yummy! Omg the lobster bisque and the maple mashes sweet potatoes dear god those look amazing! Brisket in a bag; several bag in a box; delivered to my front door! 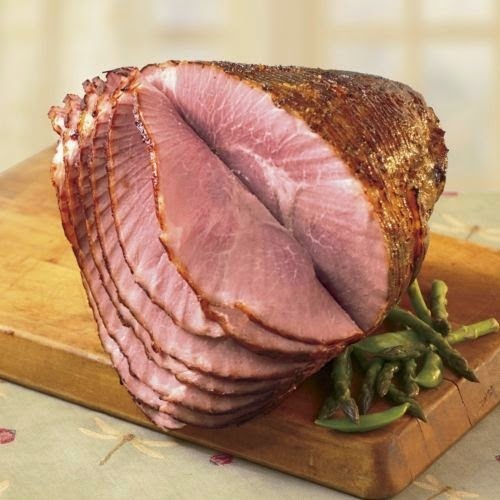 The spiral cut ham looks scrumptious!!!!! I would also like cornbread stuffing and a yummy pie! Honey Glazed Spiral Sliced Ham, Nueske's Smoked Turkey Breast, HAWAIIAN SALAD, HOMEMADE CRACKER DRESSING, GRAVY, CARROTS & ROLLS. Filet Mignon would be delicious. Ham, scalloped potatoes, green bean casserole, cooked baby carrots, yeast rolls and pecan pie. I want to try that baked potato casserole! I would like to have the German Chocolate Cheesecake. I would love to have the Spiral ham, baked potato casserole, green bean casserole, and the deep dish caramel apple pie! The ham would be awesome and the country white cheddar! OMG the Tur-Duc-Hen hands down looks amazing. I would love to have the Andes Mint Cheesecake on my holiday table. Sure could go for a ham and swiss on rye! The honey baked spiral sliced ham, blueberry bread pudding. I also would like the mac and cheese, green bean casserole and garlic mashed potatoes to go with it. I would love to have the Honey Glazed Spiral Sliced Ham, Green Bean Casserole, Baked Potato Casserole, Apple, Walnut & Cranberry Stuffing, and Triple Berry Cheesecake for dessert yum!!! A honey glazed ham with sides of Cornbread Stuffing, Green Bean Casserole, Garlic Mashed Potatoes and a delectable dessert of Deep-Dish Caramel Apple Pie. Oh! This would be wonderful to win for Christmas dinner. I would want to get the loin lamb chops. Pork Wellington wraps the juiciest pork tenderloin in a flavor-rich blend of Port wine, juicy cherries, fresh thyme and balsamic vinegar. Lamb Wellington brings fragrance and assertive taste to the meal with aromatic rosemary and caramelized sweet onions. Salmon Wellington presents a mouth-watering catch of flavors surrounding tender Atlantic Salmon Filets: a pesto of pine nuts, parmesan cheese, fresh basil and lemon juice. Along with the ham I would love garlic mashed potatoes, green bean casserole, broccoli rice casserole, stuffing and raspberry chocolate cheesecake. I would choose the filet mignon, cornbread dressing, baked potato casserole and the Triple Berry Cheesecake. Thanks for the chance to win. I would serve mac and cheese. Green beans, whipped sweet potato casserole topped with praline pecans and rolls. I will be serving turkey & gravy, mashed potatoes, yams, green bean casserole, stuffing, cranberry sauce, and chinese coleslaw. I really love ham !! Smoked Turkey, mashed potatoes & gravy, green bean casserole,stuffing and chocolate covered cheesecake bites. Tender Filet Honey Glazed Spiral Sliced Ham, Bone-In Prime Rib, Apple, Walnut & Cranberry Stuffing, Baked Potato Casserole, Chocolate-Covered Cheesecake Bites,Deep-Dish Caramel Apple Pie, Snowman Torte SO YUM! Crossing my fingers big time! I would love the Caramel Apple Cheesecake, baked potato casserole. and the Green Bean Casserole. Oh my word those look amazing. Triple Berry Cheesecake looks amazing! I love the other "white" meat !! If money were no object, We'd have Salmon Filets, Lobster Tails, Bacon-Wrapped Filet Mignon, and Lamb Wellington... instead, I sure we'll have the standard turkey and dressing. A honey spiral ham with cornbread dressing, Mac and cheese and green bean casserole with cherry cheesecake and German chocolate cake! It would be like being home for Thanksgiving!! Mac n cheese, baked.potato casserole, all the desserts and rolls!